Lara is browsing the internet reading newspaper archives, when she finds an article in a newspaper from 1970 that says that 'Another Golden Mask Exists!' 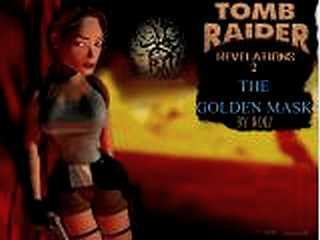 Lara is reading the article: It is more than probable that a second mask exists, because archaeologists found a huge tomb in the Sahara that has the motives of the Golden Mask and the ancient scripts also say that it is laying in a tomb in the Golden Valley. The archaeologists could not enter the tomb because the entrance would require the first Golden Mask. Some of them tried to excavate it, but they all died somehow; maybe because of the curse. Fortunately Lara has no such problems since she has the mask she acquired in 1997.